Engraved plaques are more than likely to be exposed to outdoor conditions. It is essential that the lettering and any other part of your design are as durable as possible. 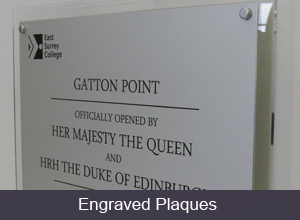 Engraved signs are ideal for any project requiring a memorial or commemorative plaque. The design is cut into the surface of the material, meaning it won’t fade away over time. It can be coloured by applying a paint infill into the engraved part of the image. 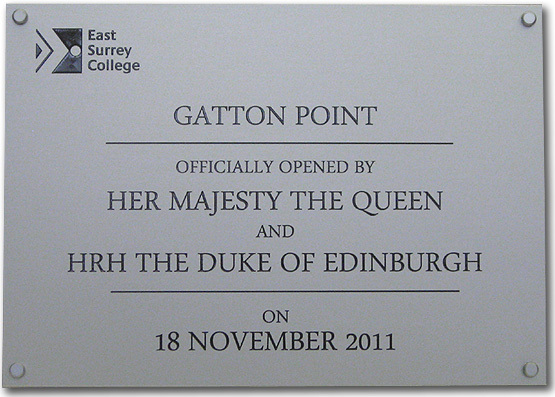 Commemorate a special event, an important or historical place or person with a stylish commemorative plaque made by our highly skilled engravers. The erection of engraved plaques on buildings of historical importance has been traditional in many different countries around the world. Events such as the opening of a new building would not be complete without a suitable commemorative plaque being proudly revealed at an unveiling ceremony. Like our memorial plaques, our commemorative plaques can be made from brass, bronze, stainless steel, aluminium or acrylic laminate. Customers can choose a material that suits their purpose best. Our skilled engravers can incorporate detailed designs such as a coat of arms. For this, we may require artwork so we can accurately create it. We can advise you on choosing a material that will suit your purposes best and guarantee the highest quality of finish. Our team of highly skilled engravers can advise you on the most suitable materials for your intended location of your engraved plaque. We will provide you with aftercare information so that your plaques stay looking good for longer. At Able Engraving, we produce high-quality memorial plaques. Our engraved plaques are suitable for all kinds of memorials. Our memorial plaques can be made from a range of materials, including brass, stainless steel and traffolyte. We can also supply beautiful hardwood backing boards which can increase the strength and compliment the quality of the design. You have control over the design of the plaque by selecting from our wide range of traditional and ornamental fonts. All tastes are catered for including beautiful and tasteful classic designs. An engraved plaque will preserve their name almost indefinitely, and be a touching tribute to the departed, whether made to be standalone or mounted on something dedicated to them. For helpful and friendly advice on our plaque engraving service or any other services or products please call us on 01342 843211 (tap to call on a mobile), or contact us here.